Daiya Cutting Board Shreds are a revolutionary breakthrough in dairy-free, soy-free, and gluten-free cooking! By far their finest cheeses yet, they've got irresistible taste, and they melt and stretch so much like real dairy cheese, most people would never guess these don't contain milk, casein, or anything else animal-derived! Use Cutting Board Shreds in all of your favorite recipes, or as a tasty last-minute sprinkle to add the perfect cheesy flavor that you've been missing. 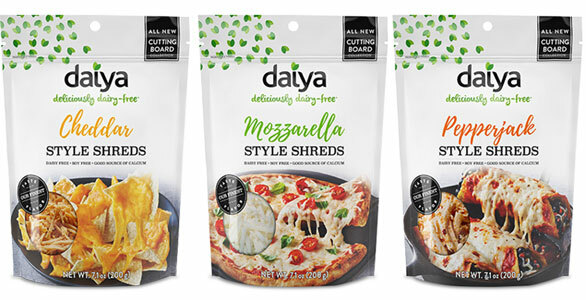 Daiya Cutting Board Shreds are available in 3 classic flavors, including Cheddar, Mozzarella, and Pepper Jack. All varieties are available in 7.1 oz. (200g) packages which are $5.99 each. From Anonymous of Concord, California on 11/7/2018 . From Anonymous of Phoenix, Arizona on 8/20/2018 . The Cutting Board Cheddar is amazing. It actually melts and tastes frighteningly close to cheddar made from dairy. A little goes a long way to making amazing vegan nachos. I was not a fan of the original Daiya but the Cutting Board is so worth a try. From Erica of Belle Vernon, Pennsylvania on 6/1/2018 . I had really high hopes for this mozzarella. I had read that it was a major improvement over the original daiya. I thought the taste when melted was ok, but it still has that weird sticky texture that I find all vegan mozzarellas seem to have. Its gooey and sticks to your teeth. Not a fan, but I also haven't found anything better. From OneLove420 of Amherst, Massachusetts on 5/31/2018 . This genius invention is worthy of the Nobel peace prize. A bold landmark in food technology, a paradigm shift of epic proportions. I salute the makers of this cheese! Stores are running out of stock quickly, Whole Foods in my area is totally out, Stop and Shop is the only other grocery outlet that carries it, online is another option. From Heather of Grand Junction, Colorado on 5/5/2018 . This is one of the most affordable vegan cheeses. Daiya stepped up their game, because this Cutting Board Collection is amazing! They melt well, to a stringy melty texture, like real cheese, so it's really delicious on pizza, grilled cheese, pasta, mac and cheese, really anything and everything. Buy this, you won't regret it! If you weren't impressed by Daiya before, definitely give this new upgraded version a shot!